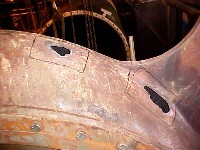 With hub removed from the ship's propeller shaft, close-up view displays areas of the cracks in the hub. Crew stitches up over 150" of crack on the hub. 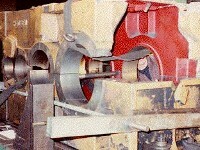 Hub being installed onto the tail shaft. Estimates in replacing the heat-fitted hub ran to approximately $250,000 and nearly six months of lead time Five days of stitching at 10% of the estimated replacement cost brought the hub back into service. This type of repair for hub securing these enormous seven foot blades had never been attempted before. As proof of the strength of the repair, the ship set out on Lake Superior later in early spring. This time the ice sheared off the propeller blades. After ballasting the tanks, an inspection revealed the hub was as good as new. New blades were replaced.